This entry was posted in Emily Nyberg and tagged 1970s, adaptation, america, american youth, americans, appropriation, artists, bluegrass, cultural repetition, festival culture, folk, folk festival, folk festival culture, folk music revival, idea sharing, James Taylor, Joni Mitchell, mariposa, musicians, traditions, USA, women, youth by nyberg. Bookmark the permalink. This is definitely an important topic! It brings into question the ethics of music making. When artists borrow from other composers in their new songs, do the original composers roll around in their grave? Would they approve? There is a fine line between artistic license and expression of notes that are written, and borrowing melodic material for use in a different piece with different intentions. What should be allowed? At what point should the line be drawn? How ethical is it? Is it considered respectful of the composer? What do you think? I am sure there is a broad spectrum of composers with different points of view. Some may not want any of their music or motives borrowed. Others may want to approve it first. Others may not mind at all. At what point does the piece become a new piece? Hey Emily! This is a great post, not to mention the clever title. You and Madeline both point out the political undertones that folk music has and that these festivals were a way that these like-minded individuals could come and get together. I also like how you brought up that artists also reused old folk songs at these festivals and made them their own and that this is a practice that is still seen today. Luke brings up another interesting point with his blog post about the priest-turned-folk-singer and that people might also just be exploiting these festivals and revivals just to earn some extra money. You point this out, but it’s just worth reinforcing that some of the performers may not have believed in the same ideals that the people at the festivals and just hopped on the bandwagon because it was the cool thing to do at the time. Also, it seems many music festivals today feature popular artists and I wonder if they still hold the same significance to people now as they did during the folk revival or if they are simply just a hub for musicians to gather and perform. 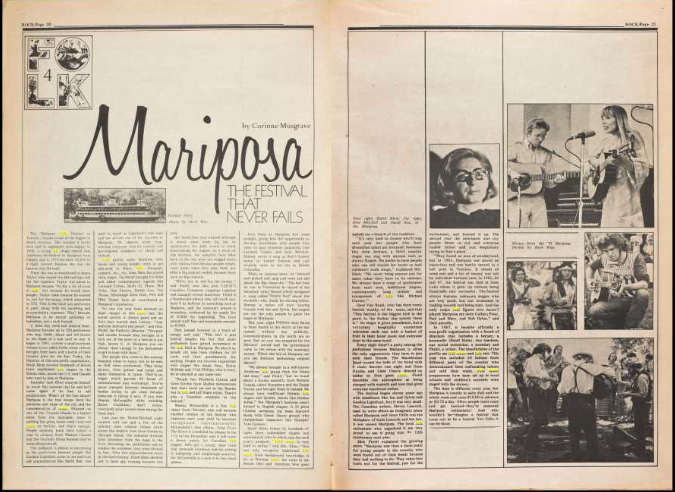 I looked at the line up for the Mariposa Festival and interestingly, there is a group that will be performing called the Lomax Project, and they reimagine songs collected by the Lomaxes. 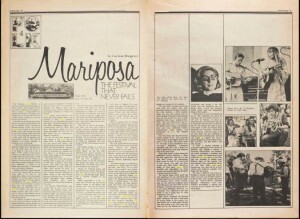 I just thought it was pretty cool to see that people are reviving the folk music that was being revived back when the Mariposa Festival first started.